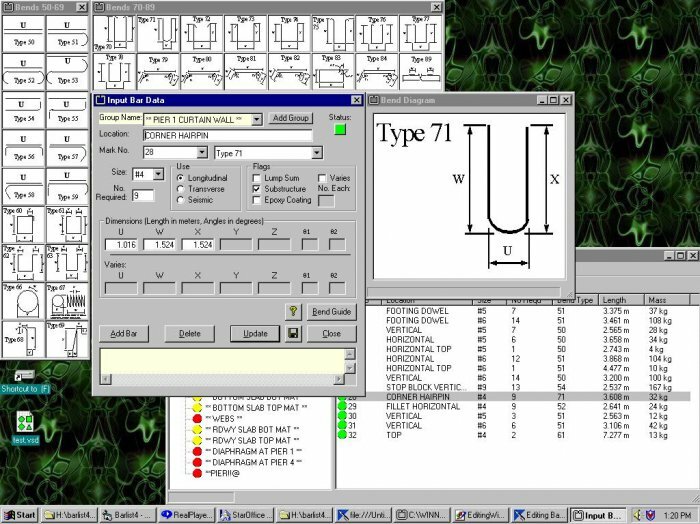 The Washington State Department of Transportation (WSDOT) Bridge and Structures Office’s Barlist program is used to estimate the weight of steel reinforcement bars used in a bridge structure and to assist in the creation of barlist drawings for bridge project contract plans. This software has been developed for the Alternate Route Project. 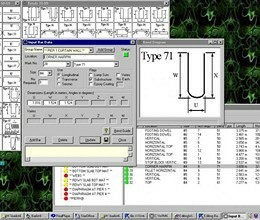 Version 4 features an Explorer-style interface for managing reinforcement groups and bar records, an interactive bend guide for selecting bend diagrams, and support for third party add-in components. Barlist is licensed with the Alternate Route Open Source License. An intuitive bar entry form. The ability to add, delete, cut, copy, and paste bars within groups. Utilize barlist files used in Barlist versions 2 and 3. The ability to create and manage collaborative barlist projects. A "Welcome" wizard to get your projects off to a quick start. The ability to view and create printed reports of the barlist. The ability to sequentially renumber a selection of bars. Real-time error and warning messages. Program extensibility through the development of add-ins. * Barlist download link provides gnu general public license version of the software. Barlist has been rated 5.0 out of 5 points. A total of 1 votes cast and 0 users reviewed the software.